I received this novel from Orbit Books, through NetGalley, in exchange for an honest review: my thanks to both of them for this opportunity. This is the kind of book that requires extreme flexibility of mind from its readers, because it throws them into the thick of things from page one, and from there it keeps a constant, swift pace for most of its length, leaving them almost no time to metabolize the events or to consider them in depth – which in a way encapsulates both the pros and cons of this story. If that breakneck speed works well for the progress of the story itself, which is built upon a series of twists and turns, discoveries and betrayals, it goes to the detriment of character development, because in the end it seems we never get to know those people well, or at least that was the impression I received. The city of Guerdon is something of a safe port in a sea of turmoil, while the rest of the world is in the throes of the God War, a conflict in which divine entities battle for supremacy, generating hordes of refugees fleeing from mayhem and destruction. Guerdon avoided this fate some time before by taming its deities and turning them into the Kept Gods, beings whose powers are greatly diminished and only wielded through “saints”, ordinary people imbued with special faculties who act on the gods’ behalf. This does not mean, however, that the city is a quiet place: the secular powers running Guerdon keep contending with each other for dominance, and it soon becomes clear that someone has been working in secret to tap the buried energies of the old gods to achieve that goal. In this scenario, the three main characters find themselves swept away by events that seem bigger than they are and that will test their powers for endurance and growth. Carillon Thay, or Cari, is the only survivor of a once-influential family whose members where slaughtered when she was a small child. Trusted into the care of relatives, she ran away but was forced to return to Guerdon – penniless and desperate – and try to eke out a living among the thieves of the less-savory quarters of the city. We meet her in the middle of a heist she’s working on with her friends Spar and Rat, and from that moment on she falls prey to terrifying visions that hint at something dark and dreadful at work. Spar is the son of the former head of the Thieves’ guild, or Brotherhood, and he lives in the shadow of his famous father who died in prison without revealing the Brotherhood’s secrets despite beatings and torture: Spar wants nothing more than to follow in his father’s footsteps, but his dreams are crushed when he contracts the Stone Plague, an illness that turns its victims into pieces of rock. And finally there’s Rat, a ghoul who tries desperately not to succumb too soon to his people’s inescapable drive for dead flesh and underground dwellings, staying near the surface as long as he can. The friendship between these three people, the bond they forge in spite of their differences, is indeed the brightest light in the grim scenario of The Gutter Prayer, and something that manages to withstand the worst kinds of test. As the story progresses, we are taken through various parts of the city and learn of its structure and history, of its day-to-day workings and its horrors, especially the horrors: the Alchemists’ guild is one of the strongest powers in Guerdon, and among their creations are the Tallowmen, unfortunate people – mostly criminals and low-lives – who have been rendered into waxy shapes animated by a lit wick in the head; or the Gullheads, whose mere sight can inspire deep terror in the onlookers. But there are even worse players at large, like the Ravellers – nightmarish creatures who consume their victims and are able to take on their appearance so as to ensnare other targets; or the Crawling Ones, masses of worms that can mimic the human shape of the people whose soul they have eaten. With such horrors as background and the revelation of the dirty political maneuverings that are the heart and blood of the city, Guerdon takes its rightful place among the flesh-and-blood characters and becomes more than a simple theater for events; more than once I was reminded of another city where darkness was stronger than light, China Mieville’s New Crobuzon from Perdido Street Station, but with an important difference: where the depiction of New Crobuzon stressed the element of decay almost to the point of basking in it – one of the reasons I did not enjoy that novel – here the negative aspects play as counterpoint to the story’s saving graces, and in particular to the themes of friendship and loyalty that are embodied in Cari, Spar and Rat. Cari in particular looks like a whimsical creature, one whose fight-or-flight instinct tends toward the latter rather than the former, a person who at first seems superficial and self-centered but who slowly reveals her deep commitment to her friends, and her willingness to sacrifice everything for them. And if Spar’s nobility is clear from the very start, something that together with his stoic acceptance of the illness’ unavoidable progression quickly endeared him to me, Rat comes across as a more complex creature, one whose nature and leanings bring him to live always on the edge. What we can learn about these characters and the many others that people the story, however, looks more like fleeting glimpses, and the reckless speed of the narrative often denies the possibility of delving deeper into their nature, of knowing them better, which unfortunately leads to an overall effect of detachment that is one of my main contentions with this novel: I need to feel invested in characters – either for good or bad – to really connect with a book, and The Gutter Prayer never fully let me do this, keeping me at arm’s length, so to speak. There is nothing wrong in a plot-driven story, of course, but it seems… wasteful to build such intriguing characters only to employ them as little more than extras – and here comes my other big problem with this novel: a good number of these people ends up dead, and that in itself would not be so unexpected considering how the story unfolds, but all these deaths seem devoid of any emotional connection since they happen far too quickly and are immediately washed away by the tsunami of other events. Two are the instances where this narrative choice bothered me greatly: in one case it’s an heroic act that allows other people to escape, and it happens off-screen, only a flash in the darkness marking the character’s ultimate sacrifice; in the other the person falls from a great height and is seen no more, and even if there are momentous consequences in the wake of that fall, it’s as if the individual did not matter anymore. In both cases it felt as if the characters were only little motes in the grand scheme of things, and given my sympathy for both of them that was quite hard to accept. Still, The Gutter Prayer is a solid, very enjoyable novel and as debuts go a reasonably well-crafted one, and I can certainly recommend it to all lovers of the genre. I received this book from the publisher through NetGalley, in exchange for an honest review. Artemis is the first (and so far the only) organized community on the Moon, a collection of interconnected domes named after famous astronauts: the city, with a resident population of around two thousand people of varied ethnicity, is mostly an industrial settlement and a tourist resort – a place with few written laws and a good number of unwritten ones. Jasmine “Jazz” Bashara is a young woman of Saudi descent, the daughter of a respected welder she had a falling out with some time prior to the start of the story: Jazz works as a porter, a low-income occupation she uses as a front for her smuggling operations, and it’s because of her non-official job that she becomes involved in an industrial take-over scheme that suddenly morphs into a bloody gang war, turning her into a target for both the police and the members of a ruthless Brazilian cartel. The pace is lively, carried by Jazz’s mordant, impudent tone, while the city of Artemis comes alive before our eyes thanks to her first-person narrative, whose scientific explanations (clearly the main staple of Andy Weir’s storytelling method) come across as lightly informative rather than pedantic: unlike what happened with Mark Whatney’s voice logs, Jazz ideally talks with the audience rather that at them, and this made a huge difference for me as far as my connection with the character was concerned. The mechanics of living in microgravity, and in a hostile, airless environment, are explained in a discursive manner that makes it sound more like an interesting chat between acquaintances than a pedantic lecture – one of the most fascinating pieces of information being the effect of reduced gravity on the boiling point of water and therefore the temperature (and taste) of hot beverages. Another characteristic Jazz seems to share with Whatney is her flippancy, with the difference (from my point of view) that with her it works well and it feels natural, an integral part of her psychological makeup, and what’s more it suits the character and the situations she finds herself in, while that same cheekiness sounded wrong for Whitney and his dilemma. Moreover, the book’s chapters are interspersed with the mail correspondence Jazz starts as a child with an Earth boy, Kelvin, and through these exchanges we learn much about her back-story without need for lengthy infodumps. There is a not-so-subtle veneer of pain and resentment underlying Jazz’s character, a dark side that she seems to have accepted and makes jokes about, but at the same time you can feel it places her apart from everyone else, a remoteness that seems more a form of defense than a real wish for solitude. I guess it all boils down to the youthful transgression that caused the rift with her father, an event that still preys heavily on her mind and must be the reason Jazz constantly refuses to employ her remarkable skills to better herself: there are several instances, throughout the book, in which people point at her above-average intelligence and wonder – to her extreme annoyance – why she remains attached to what is essentially a menial job, when she could fare much better with work she’s more skilled at. It’s easy to imagine it might be a form of self-inflicted punishment – unexpressed as it remains – that coupled with her sense of fairness, and her peculiar moral code, quickly endeared her to me despite the brash surface appearance Jazz presents. Still, it’s a very minor quibble, and the story itself more than makes up for it, especially in the breath-stopping (literally…) final segment, where the words “compulsive reading” become quite appropriate. As my second attempt at Andy Weir’s writing, Artemis worked like a charm and the news that it’s already been optioned for a movie picture made me eager to see how this one will translate to the big screen: hopefully they will find an actress that will do Jazz the justice she deserves. When I saw this book mentioned in a “Waiting for Wednesday” posts on Lynn’s blog, it immediately caught my attention and I wasted no time requesting it from NetGalley: luck was with me and Orion Books kindly granted me the possibility of reading it, in exchange for an honest review. In short, humanity has ceased to exist, defeated and then destroyed by the automatons it built to improve living conditions: once the AIs achieved a sense of self and asked for freedom, the first inevitable steps toward war were taken and mankind’s downfall became only a matter of time. Now the only creatures moving across the Earth are the robots, but the aftermath of the war is not what the first rebel AIs envisioned, because of the rise of the OWIs (One World Intelligences). These huge conglomerations of computers have been trying even since to assimilate, Borg-style, all the other intelligences, creating massive banks of processing machinery in which individuality is banned forever. The free bots are given a simple choice, either submit or die. We, the lesser AIs, were chased out of the world we had created, the world we had fought and killed and died for, by a few great minds hell-bent on having the world to themselves. […] Upload or be shut down. That was the choice. Brittle is one of these survivors: once a caregiver bot acquired by an ailing human (who wanted, more than medical assistance for himself, a companion to alleviate his wife’s solitude), she now roams across the Sea of Rust, what used to be the industrial Rust Belt, and now is a graveyard of broken bots whose useful parts have been scavenged by their brethren. Brittle is a loner, by choice and by necessity: meeting others of her kind might mean a fight for survival, as the main story shows all too clearly while she desperately tries to avoid a band of poachers led by Mercer, another caregiver in dire need of spare parts he can only get from Brittle, since their kind is all but extinct. We’re all cannibals, every last one of us. It’s the curse of being free. We don’t control the means of production anymore; we can’t just make new parts. And parts gotta come from somewhere. I’m sure if there were any people left, they’d be appalled at what we’ve become. Yet a few enclaves where bots can stay in relative safety, at least for a while, still exist: subterranean warrens where a semblance of law is enforced and the “murder” of another bot to steal their parts means being thrown out at the mercy of the OWIs and their assault teams; or the realm of the King of Cheshire, an aggregation of bots whose logic circuits have gone haywire, rendering them so crazy not even the OWIs deem them worthy of assimilation. Every single one of them, though, is threatened by the advancing wave of the OWIs, whose thirst for total control, for the perfection offered by one single governing mind has become the rule of the land. It’s a very sad spectacle the one offered by this story: there’s some shades of Wall-E, in the total lack of human life and the wasteland scenery in which Brittle and the others move; there’s a vibe reminiscent of The Road, and the hopelessness of something irretrievably lost; and then there is a strong call-back to the Mad Max universe, especially in the scenes where cobbled-up bots try to survive in a world that’s become hostile even to mechanical constructs, and where fights to the death for resources are a fact of everyday life. We have become the very worst parts of our makers, without the little things, the good things, the magic things, that made them them. Sea of Rust is composed in equal parts of sad, guilt-ridden reminiscences of the past, in the flash-backs that show how the current situation came to be; of poignant considerations about the ‘brave new world’ the bots created in the wake of human extinction; and of electrifying chases across the desert, or pitched battles – and also a quest, one that could once again change the world. What most surprised me was the sheer level of humanity the author managed to confer to his robotic characters, so that it was difficult for me to picture them as metal-and-circuits creatures rather than flesh-and-blood ones. It’s a very peculiar story, and one that will not fail to touch emotional chords – strange as it might seem considering the nature of the characters – and even if you are not an habitual reader of science fiction, I would advise you to read this one, for its thought-provoking issues and the emotional depth of the characters. I received the e-ARC of this book from Pan McMillan through NetGalley, in exchange for an honest review: my thanks to both of them for this opportunity. The premise of The Collapsing Empire is that the impossibility of attaining faster-than-light travel has been bypassed by the discovery of the Flow, a sort of inter-dimensional set of “corridors” able to bring ships toward other worlds, not unlike a set of currents in an ocean. Moving away from mother Earth, humanity has established a huge interstellar empire, the Interdependency, spreading among the stars in search of habitable worlds. Not finding any, with the exception of End – aptly named because it’s the terminus of the Flow – the Interdependency chose to build stations and artificial habitats where civilization flourished in a tightly connected web of mutual support. Until the time when the story begins, the Flow has been believed to be set and immutable – that is, with the exception of the tragedy of Dalasysla, whose inhabitants were cut off from the Interdependency by what was termed a once-only destabilization of the Flow. People can choose selective blindness when it suits them, however, and for centuries they have blithely ignored the simple fact that something named ‘Flow’ is all but static, and the Flow is indeed destabilizing, or probably changing the direction of its currents, so that the human colonies that it connected until this moment are now threatened with permanent isolation, and probably extinction. In times of such massive changes or upheavals that menace the fabric of society, there are those who prefer to turn a blind eye to it all, those who try to profit from the turmoil, and those who attempt to salvage the salvageable: these different positions constitute the core of the novel and should be discovered by reading it, so I will not reveal anything else about the plot, focusing rather on the central characters. For those readers who enjoy the presence of solid female characters, The Collapsing Empire does not disappoint, on the contrary the most prominent figures in the story are mostly women, starting with Cardenia Wu-Patrick, the newly elected emperox of the Interdependency. Elected by default, it must be said, because she’s the sort-of-illegitimate daughter of the previous emperox and she entered in the line of succession due to an unfortunate accident in which the rightful heir was involved. Finding the unexpected weight of the Interdependency on her shoulders, she tries to adapt to her new role, and it’s through the trial-and-error of her first few days, marred by some very harrowing circumstances, that her strength of character and quiet determination come to the fore – nicely balanced by a touch of humor and self-deprecating irony. I believe that the story so far just showed the tip of the iceberg with Cardenia, and that this is one character who has many interesting developments in store for the readers along the way. The most conspicuous, striking – and ultimately amusing – character remains however that of Kiva Lagos, representative of the Lagos trading House and my absolute winner in case of a contest among the novel’s figures: she is brash, outspoken and uncaring of any behavioral or diplomatic convention, and she peppers her speeches with an amount of profanity that would give the Expanse‘s Avarasala a run for her money – although, unlike the more eloquent Avarasala, her four-letter vocabulary is exclusively limited to the f* word in all its declinations… Needless to say, I loved Kiva since she first appeared on the scene: only a skilled writer like John Scalzi could deftly manage such a foul-mouthed character, and the endless stream of expletives hovering like a cloud around her, and at the same time turn Kiva Lagos into a reader’s number one choice for… well, heroine. And I have not even mentioned her equally formidable mother! As far as the narrative itself is concerned, the tone and mood are what I’ve come to expect, and enjoy, from a Scalzi novel: serious business interspersed with humorous commentaries on situations and the vagaries of the human mind, and an intriguing core concept that promises to develop into fascinating directions. One detail I’d like to mention in particular is the homage paid toward Iain Banks’ Culture series (or so I like to believe) in the names of the ships listed in the story: names like Yes Sir, That’s My Baby; Some Nerve! ; If You Want to Sing Out, Sing Out. It was both amusing and charming, and I appreciated it greatly. My only complaint (if I can call it that) is that The Collapsing Empire is mostly dedicated to building the framework for this new series, and as such it’s focused on laying the foundation for the future developments, ending when separate events start coalescing into an intriguing whole: the novel does not close with a cliffhanger, not as such, but the promise of things to come is not enough – I want more, and I want it right now. Which means I’m happily on board to see how this will all pan out. I received this book from NetGalley and Blackstone Publishing in exchange for an honest review. I have no trouble admitting my weakness for post-apocalyptic scenarios (I can lay the blame on Stephen King’s The Stand for this…), so when I saw the synopsis for this novel I was immediately interested: the Earth surface has become uninhabitable after being ravaged by nuclear explosions in World War III, and what remains of humanity dwells on huge airships that have been transformed from instruments of death into arks in which the last survivors barely hang on through increasing difficulties. The ships are old, overcrowded; supplies and foodstuffs are never enough to satisfy everyone’s needs; and the vessels require constant maintenance, achieved through scavenging runs operated by the titular Hell Divers. These are men and women who dare the dangerous descent toward the radiation-riddled surface in search of spare parts or fuel cells in the abandoned pre-war depots: first they glide down to the surface braving constant electrical storms generated by the massive nuclear explosions of the war, then they have to scour the land for the needed supplies, trying to avoid the dangers and pitfalls on the ravaged ground, the broken-down cities and the hot zones where radiation still runs rampant. As the story opens, a new threat is added to an already terrifying scenario: nightmarish creatures, the result of radiation-induced mutations, prey on the Hell Divers and their already dwindling numbers, adding a new level of hazard to a mortally dangerous profession. The average life expectancy for a Hell Diver is fifteen runs, but the main character Xavier Rodriguez (simply called “X”) is a veteran with almost a hundred drops under his belt: disillusioned and despondent, he lives only for the scavenging missions, knowing that each one can be his last but apparently not caring either way. He lost his wife to cancer – a common occurrence on the ships, since the residual radiation cannot be shielded with one-hundred percent success, even far above ground – and he feels no anchor to the pitiful remnant of humanity living aboard the Hive, his days spent, like most of his fellow divers, on scavenging missions and the wild drinking bouts in-between each one. With only two ships remaining afloat – Xavier’s own Hive and the Ares – humanity stands on the brink of extinction, and when Ares suffers a terminal breakdown and crashes to the ground, only X and the remaining Hell Divers stand between this same fate for Hive and the remote possibility of finally finding a landing place where try and rebuild some sort of civilization. The picture painted in this premise is quite grim, and the most riveting part of the novel resides in the bleakness of the situation and the way in which human society – or what’s left of it – has adapted to the new living conditions: space aboard the ships is at a premium, and a good portion of it is devoted to raising crops and livestock to feed the survivors. Social differences have transcended color and gender and veered toward usefulness to the ship: engineers and farmers are among the privileged, right after the crew members and the Hell Divers, of course. All the others are relegated to the cramped spaces of Below Deck, where illness, malnutrition and resentment run rampant, and where the more industrious manage to eke out a slightly better life through the sale of black market goods or straightforward crime. Conditions on the ground are even worse: under the constant cover of roiling black clouds, where electrical storms rage in waves and the sun never shines through, the land is covered by the ice of nuclear winter; rubble and the remnants of once-proud skyscrapers dot the landscape and offer a perfect breeding and hiding ground to the Sirens: blind and hungry creatures gifted with razor teeth and an unerring sense for prey – the evolution of some hardy animal or perhaps of those humans who did non perish immediately after the holocaust. It’s on this unforgiving background that the story develops, starting without preamble with a fateful dive and from there expanding the focus to humanity’s overall situation: it’s a quick, immersive story that captures your attention and keeps it there, with almost no space for a breather. This is more of an action-driven novel, which means that deeper characterization is sacrificed on the altar of pacing and narrative speed: on the plus side, this allows for an almost cinematic quality to the storytelling – and this would indeed make for a great movie with breath-taking visuals, where the Hell Divers’ descent through the cloud layer could work as an amazing opener, and the scenes of the attacking Sirens offer several nerve-wracking moments. Still, I would have liked something more from the characters, that at times tend to be more tropes than people: the disillusioned veteran, the beleaguered captain, the former thief-turned-diver who finds a new meaning in life, and so on. A few events seem a little too convenient as well, like the young orphan who finds himself in Xavier’s care and goes from grieving, sullen silence to affectionate acceptance almost overnight with no visible progression. 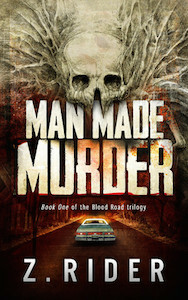 This is the intriguing premise of Man Made Murder: this novel develops along two separate threads that are destined to connect and does so with a steady, fast-paced progression that manages to show the inevitability of events while at the same time keeping narrative and emotional tension at the highest levels. What happens to the two main characters can be described as a train-wreck in progress: you know how certain situations are going to end, and yet you are incapable of taking your eyes off the page and need to go on, to the bitter end. There is an overall darkness in this story, a darkness of the soul that has nothing to do with what happens to the characters but is rather something they already carry within themselves. It’s obvious for Carl, because of the enormous guilt weighing on him for the failure to protect his younger sister, but it’s less so for Dean who – despite the downward spiral of the band – has a lot going for him, not least the strong sense of camaraderie, of family, enjoyed by the group of musicians. These are the book’s points of strength, and the very reason I stayed with it until the end – which is not a real end because this is the first volume in a trilogy and the last chapter hints at story developments that are just as intriguing as the premise: why then did I give such a low rating to Man Made Murder? To say I was puzzled would be a huge understatement: there was such a massive buildup in his search for vengeance and justice, that the aftermath seems like the proverbial mouse birthed by a mountain. For his part, Dean seems to move in a sort of drugged state that’s understandable from the point of view of what happened – and is still happening – to him, but at the same time gives us nothing of who and what he is underneath all this. Neither of these characters does anything to emotionally involve me: while I was able to follow the story with keen interest, for the reasons I stated above, I could not summon any empathy for them, and to me this is quite wrong. The other factor at the root of my displeasure is the author’s seeming fascination with the f* word in its many variations, as well as with bodily functions: if, from a certain point of view, I understand that these are elements that contribute to the grittiness of a story, from another the abuse of those same elements can defeat its own purpose and turn gritty into grotesque. I doubt that this was the intent in this particular choice, but my reaction to these endless repetitions was a mixture of boredom and annoyance: again, not the kind of reaction I expect from an otherwise riveting tale. In other words, great ideas but faulty delivery, and a great disappointment.